Are you a business owner / operator or entrepreneur spending way too much on your Google Adwords not getting enough traffic to your website and people to convert from visitors to buyers? Attend This Fast-Paced 3-Hour Exponential Internet Wealth Creation Workshop To Learn The Tricks Of The Trade That The Top 5% Internet Marketers Use To Make More Than The Other 95% Combined! Register NOW to qualify for the attendance BONUSES within the next 60 seconds! Is it dawning on you that your online sales have been a little harder to come by than you originally thought? In the lead-up to the 2010 Exponential Internet Marketing Bootcamp, we will be holding two FREE, fast-paced live-and-interactive events to preview the entire syllabus of the Bootcamp. In case you don't know, the Exponential Internet Marketing Bootcamp is an intense 3-day immersion experience, that produces marketing breakthroughs that expand your mindset, fatten your wallet and leave your competitors in the dust! Free Live-And-Interactive Internet Wealth Creation Workshop"
Learn Secret Stealth Marketing Strategies that will transform you from victim to victor in the cut-throat price wars that threaten the weakest players in your market. These exponential strategies are being used by Aussie entrepreneurs just like you who have doubled their sales in the last year, during some of the toughest economic conditions of recent times. Come find out what they're doing! Regardless of what industry you're in, I'll show you several strategies to that will work to get MORE people to your website and convert to willing, paying customers. I'll reveal how you can INSTANTLY get results to trigger momentum that will then get a life of its own, making it easier to do business online. I know how radical and provocative this sounds. I am going to show you how doing out-of-the ordinary things to get extra-ordinary results... Aren't you intrigued? Invest 3 hours that will payoff with a lifetime of profits. Great question! I agree that you should be extremely wary of so-called »business-building advice» that comes from ANYONE who hasn't lived it and breathed it in their own life - AND has the RE$ULT$ to prove it! "Within 12 months, I went from $0 to $1,000,000 in sales fulfilled on the Internet with less than $10,000 to prove it can be done on a shoe-string budget. I now have passive income selling products in more than 39 countries 24 hours a day, seven days a week – yes, even while I sleep!" DR MARC DUSSAULT is a self-made multi-millionaire entrepreneur, an award-winning author, recipient of several marketing awards, and an Entrepreneur of the Year Award finalist. As the founder of his own start-up company, Marc used exponential strategies to build one of his service companies 3 times faster, with double the industry average sales per employee, while consistently producing twice the profitability of his competitors. These results were achieved while I was doing an MBA and Ph.D. full-time and opening a second office in a distant city (Toronto), taking 4 international vacations for a total of 8 weeks while also franchising and distributing an integrated printing software application in Europe and publishing articles as a columnist for 3 magazines in Canada and the United States. I recently worked for a well-established global corporate software vendor with a 28-year history. Leveraging the exact same Exponential Marketing strategies I'll reveal to you during this workshop, I established a prospecting funnel that was 30 TIMES greater than the company’s norms with the same conversion ratio, increasing sales by a whopping 50% in one year with NO discounting! In addition, I also acquired several landmark ASX Top 50 companies as long-term clients while managing almost 200 accounts. Amazingly, I achieved this amazing sales record while completing a post graduate law degree (in taxation of all things!) in less than one year and playing competitive squash daily...! I don't just "talk the talk" I "walk the walk". Success is NOT just about making more money, it's about having the lifestyle to go with it! Register now to join me for 3-hours of breakneck Internet strategies in either Melbourne or Sydney. "Hear what other internet and business entrepreneurs have said about these explosive Exponential Internet Strategies"
If any of the above scenarios apply to you, book your seat now in Sydney, Melbourne or Brisbane and join the thousands of successful entrepreneurial millionaires who have been enriched by the exponential ideas, strategies and advice you'll hear about during this free preview event – BOTH, offline AND online. Master the Exponential Mindset to make your own money-making connections, starting right now. "The Exponential Growth Strategist, Dr Marc Dussault, shares his little-known strategies to help you get the most value out of the next Exponential Business Building Bootcamp..."
The SUCCESS FACTOR that separates the winners from the losers, you're either one OR the other - NO middle ground! This breakthrough autopsy report, based on extensive survey of Australian SME business owners, will strip your business naked right in front of your eyes in less than 29 minutes. The good thing is, you're the only one watching! This revealing survey - one of the largest of its kind in Australia - reveals what Australian business owners are and aren't doing to generate sales leads and sales online. In over 11 pages of detailed results and analysis, you'll discover what the top 5% of SMEs are doing to generate cash, customers and profits online and also learn from the costly Internet marketing blunders that the vast majority of internet marketers are making without even realising it. The results of this survey will surprise and shock you - ignore their clear message at your peril. This report exposes what the successful entrepreneurs have kept secret for so long. Now it's your chance to get into the 'mindset' of a champion and uncover how you can replicate the same results for yourself, in your business. This report is ONLY available to attendees of this WEALTH CREATION WORKSHOP. The Internet is well known as the easiest thing that's hard to do - UNLESS you KNOW what the successful Internet Marketers know. Get your hands on this report and transform your website into the 24-hour-a-day money-making machine that pays you even while you sleep. Imagine having the rule book to the game of business and the Internet with all the winning strategies. Better yet, imagine your competitors not knowing the rules YOU set for the games you want to play! The software company that generated $150,000 in sales 6 months faster, beating their old conversion rate by 200% - with no discounting! The specialised health care provider that booked more than $150,000 in treatments in less than 3 hours with less than $1,000 in marketing costs! The training company that tapped into another company's database to generate $5,000 in windfall revenue in less than 30 days. Total cost: $300! The consultant who made $6,000 in one hour. Yes, one hour. And then made an additional $2,000 without even lifting a finger! The personal coach who created $6,000 in 6 days from one distinction e-mail! How about the consultant/trainer who increased his prospect-to-paying client conversion by a WHOPPING 10 times - not 10% or even 100%, but 1,000%!!! Spending HALF as much as you are now on Google Adwords and getting TWICE the number of leads that are even BETTER qualified?!?! Getting people to find out about you for FREE 24 hours/day, 7 days/week... and deciding on their own to do business with you... Willingly, happily and with NO hesitation... How cool would that be? Automating your sales process to reduce your sales cycle by as much as half - would that tickle your fancy? Would reducing your work week by 3 or 4 hours/week while INCREASING SALES be of interest? How about spending less than half on marketing than you are now AND increasing your PROFITS by 50% to 100%? 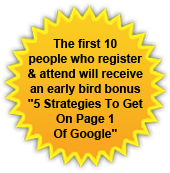 Register NOW to qualify to get your attendance BONUSES within the next 60 seconds! E-mail Important! All resources are delivered electronically to your inbox! Mobile We will send you the password to access this information in an SMS. P.S. What makes this presentation a CAN'T MISS event? If you are considering attending the 2010 Exponential Internet MarketingBootcamp, this is your last chance to find out what it’s all about. The Bootcamp program has been extended to three full 12-hour days, from 9 AM to 9 PM to ensure that you do all the homework before you go home or to your hotel room every night. I will cover strategies never-before-presented live in Australia, these are the latest online and offline shortcuts your competition is not even aware of, let alone using. You will watch full-blown Exponential 'Hot Seat' Website Makeovers in action, where I take apart and then re-build websites LIVE, on stage. 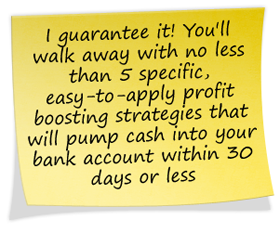 You will create your own customised ‘Profit Blueprint’ during the event so you know exactly what to do once you get back home to reap the financial rewards in your offline and/or online channel. With three 12-hour long days, you will be able to complete ALL exercises on-site with revolving group members, enhancing what is one of the most valuable aspects of the Bootcamp – exchanging ideas with other participants – who help you to grow YOUR business as you help them grow theirs! I will conduct a series of rapid-fire Q&A sessions where you’ll be invited to come and ask any question you like. I will answer those questions right then and there from the stage. If you’ve never seen the rapid-fire distinctions, trust me, you won’t want it to end.